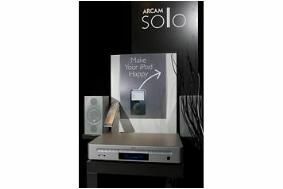 BRISTOL SHOW 2010: Arcam Solo Neo makes its UK debut | What Hi-Fi? We first saw the system at CES in Las Vegas last month, and now you can see it in the UK for the first time at the show this weekend. It's equipped with wireless or wired network audio streaming and can handle numerous audio formats from NAS drives and other network storage devices. You can find out more about the Solo Neo in our CES video report and special blog. For full details on the Bristol Show 2010, see our roundup.